Real estate HTML5 Template is modern template for real estate agencies or brokers. It is build upon Bootstrap framework to offer best customizability and development experience. Real Estate Template is incorporating dozens of real estate oriented components and HTML files. 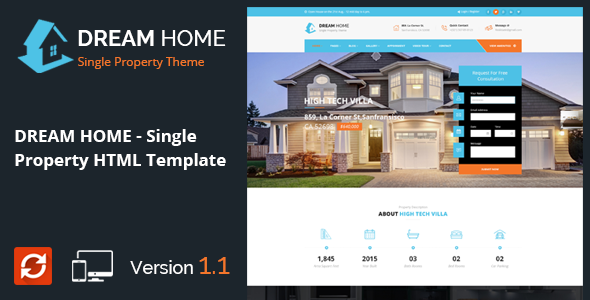 Template has advanced property detail HTML files. You can display property in tabbed or standard layout. Detail page contains property main attributes, description, image gallery, land valuation, inquire form, reviews and amenities. Real estate is a professional real estate responsive site template coded with Bootstrap framework. The Real estate comes with a creative homepage design layouts, responsive and 50+ valid HTML files. The design is very elegant and modern, and also very easy to customize with 1170px grid. We hope so you will feel happy with them. What ever you are using the device your site will run as it should be. The Real Estate template is fully responsive layout for all type of devices. The Real Estate template coded with beautiful and clean codes! Some powerful HTML files 100% valid W3 web standards. We designed 07 different homepage layouts for your next website. Default slider, Google map section, custom property slider, and more. Looking unlimited page templates? Ofcourse, the Real Estate template comes with 10+ more page examples like about, service, contact, FAQ, Pricing, Loan Calculator page, sitemap etc.